I grabbed a handful of books from Bella Books over the New Year’s holiday. 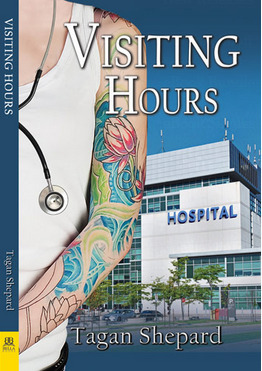 Visiting Hours by Tagan Shepard was one of their books that I had meant to pick up months ago but never got around to it. I am so glad I picked this one up. It was a fabulous read that I just adored! Dr. Alison Reynolds is a professor of history at Virginia Commonwealth University. Al is a stubborn, opinionated, at times exasperating character. I was entertained by her, rooted for her but a few times wanted to hand her duct tape for her mouth. She is definitely a spirited character! Alison spends her time divided between her responsibilities teaching, researching and visiting her bestie, Beth, in the hospital. Beth is having a medical crisis where her blood is attacking her unborn child. She has been admitted to the antepartum unit at VCU’s hospital to be monitored by Dr. Jess Baker. Jess is an obstetrician that recently relocated to Richmond via Portland. She is a highly skilled doctor, one that was heavily recruited to transform VCU’s women’s health wing. Jess doesn’t fit your typical doctor mold. She’s heavily tattooed and sports a faux hawk. Needless to say, Alison immediately takes a disliking to the good doctor. What I loved about this book is that is not a hate to love romance, more like I’m going to dislike you a bit cause I’m super scared and a bit judgy and you are going to win me over because you are super nice and caring. The relationship grows over the course of bumping into each other time and time again both inside and outside the hospital. They’re very different characters in personality and it works. Jess is a nerdy gamer with a free spirit temperament. Ali is more conservative, focused academic with a bit of chip on her shoulder. Their chemistry is explosive and hot! This is a great book from Tagan Shepard, I can’t believe this was her debut novel. Her next book, I will not even hesitate for a minute before picking it up.